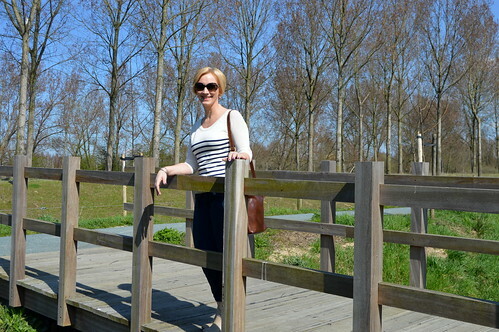 Ever since last summer I was on the look-out for the perfect striped sweater and a couple of weeks ago on my shopping spree in Maasmechelen Outlet Village (of which you can read about here! ), I found this lovely sweater at Liu Jo. The fabric is really soft and comfortable to wear. I’m combining the sweater with my blue chino pants I bought last summer at HM. Here you can see another outfit with these pants. I just know I will wear this sweater a lot this spring and summer… it’s casual and sporty, but also perfect to wear to work. I’m wearing my comfortable beige ankle booties from Alberto Fermani. I have bought them a couple of summers ago at a local store (Annick Goedhuys) who sells really cool stuff. They’re the perfect bootie for spring and even in summer I sometimes wear them under one of my midi skirts. What accessories is concerned, I’m just wearing my Fossil bangles and my & Other Stories loop earrings. The Dior sunnies are I don’t know how many years old and the brown handbag is from Clarks. I bought it last year at Maasmechelen Outlet vilage. 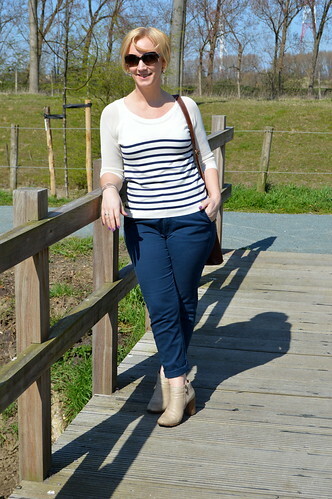 This entry was posted in Fashion, Outfits, Spring and tagged &other stories, alberto fermani, clarks, dior, Fashion, FOSSIL, H&M, liu jo, outfit, outfit of the week. Ik ben fan van de trui! Van alle trends van dit moment gaat mijn voorkeur zeker ook uit naar de bretonse strepen. Altijd mooi! Love this look. Nauticals are such a classic! Awww! I hope the weather cooperates! It’s really chilly here in Canada too, but the temperature is supposed to soar at the tail end of this week. CANNOT WAIT! No kidding! Same here in Canada. A mild winter (for a change) but a really long one. Summer will be that much sweeter!